Jack Baldwin has words of advice for his Posh team-mates. Photo: Joe Dent/theposh.com. 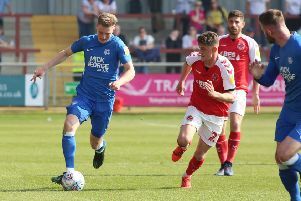 Peterborough United centre-back Jack Baldwin insists his team-mates need to ‘grow up’ and man up if they are to emerge from their dreadful run of form. The 22 year-old admits he was horrified by events last weekend (March 12) against Port Vale when he skippered a side that threw away a two-goal half-time lead before losing for the sixth time in seven League One matches. Baldwin still believes a single win will kick-start a surge up the table. He reckons it will arrive when the players rediscover the confidence in their own attacking ability, hopefully when they travel to Darren Ferguson’s struggling Doncaster Rovers side tomorrow (March 19). “It’s no use feeling sorry for ourselves,” Baldwin admitted. “I was horrified last weekend that a side I captained was capable of doing what we did, but we can’t dwell on it. “We need to concentrate on the game we are playing rather than the run we are on. “When Port Vale scored their first goal last weekend it changed us mentally. “We stopped doing what we are good at and what had been so encouraging during the first half. “It did look like it was going to be our day, but for whatever reason we then tried to play a game that involved hitting longer passes and trying to win second balls, and that’s not us. “We have to grow up a bit and be like men on the ball. “We are at our best when we are playing out from the back and creating space for our attacking players, but we were all guilty of not doing that last weekend. I was one who didn’t create the angles we needed to start attacks. “The management are always encouraging us to play. They accept we will make mistakes, but we will also create plenty of chances playing like that. “We have to get back to that style of play. You don’t lose that ability overnight. “It’s a big game for us at Doncaster on Saturday now. It’s a game we need to win and we are more than capable of getting the result we want. “Every team has bad runs, but ours has lasted longer than anyone expected or wanted. “When we do get that first win, we will most likely string a few together and get the season going again.